Las Setas, one of the top five three-year-olds. Photo by Laurie Asseo. 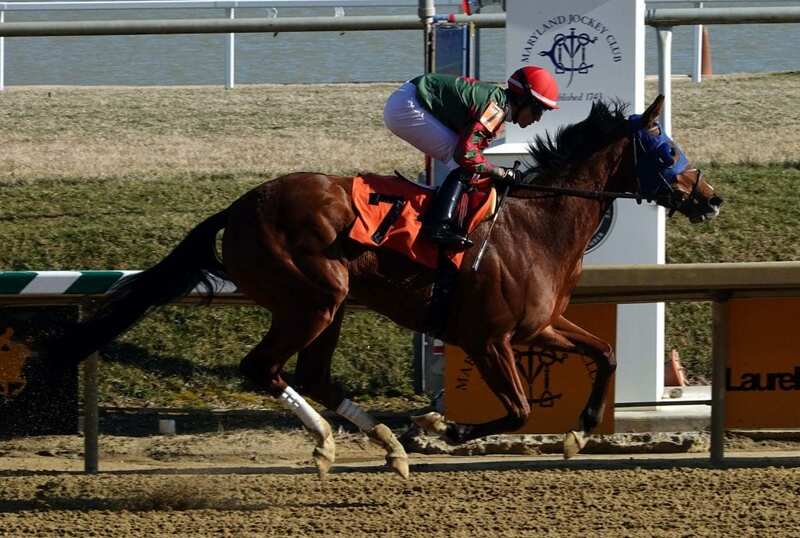 A win in the Grade 1 Central Bank Ashland Stakes led to a shakeup among the region’s top three-year-olds, with Out for a Spin rocketing to the top of the three-year-old class in the year’s second edition of the Mid-Atlantic Thoroughbred/The Racing Biz Top Midlantic-bred Poll, released March 12. Meanwhile, among older horses, Prince Lucky’s second graded stakes win of 2019 — coupled with a defeat by division leader Late Night Pow Wow — enabled him to leap into first among older runners. Out for a Spin won for the second straight time and third in five starts overall. The Ashland was her first try against stakes company, and under Paco Lopez, she pressed the early pace of favored Jaywalk before taking over and going on to win by a neck. Out for a Spin, the longest shot in the field, returned $106.20 to her relatively few backers. Out for a Spin is trained by Dallas Stewart for Commonwealth Stable. A three-year-old daughter of Hard Spun, she is out of the Came Home mare My Mammy. She was bred in Virginia by the William M. Backer Revocable Trust and was a $75,000 purchase as a yearling at the Keeneland September sale before failing to meet her reserve as a two-year-old in April 2018. Out for a Spin now has three wins from five starts and earnings of $354,903. Out for a Spin’s victory enabled her to seize a narrow advantage over a pair of runners. Last month’s leader, Call Paul (PA), finished third in this month’s Grade 3 Bay Shore and has dropped down to third position, just behind second-place Alwaysmining (MD), who won the Private Terms Stakes for his second win of ’19 and fifth straight overall. They are followed by the two-time stake-winning filly Las Setas (MD) and the sophomore colt Our Braintrust (MD). Among older horses, the easy win by Prince Lucky (PA) in the Grade 2 Gulfstream Park win allowed him to inch past Late Night Pow Wow (WV). The latter was a willing third in the Grade 1 Madison at Keeneland, a defeat that snapped her nine-race win streak. New to this month’s list of older horses was Beach View (MD), who checked in in fifth place overall. The six-year-old Giant’s Causeway mare has been second and third in a pair of Grade 2 races at Santa Anita thus far in 2019 and has three wins, and more than $274,000 in earnings, to date in her career. She was bred in Maryland by Sycamore Hall Thoroughbreds and is trained by Leonard Powell for Levy Racing. Of the 10 horses in the two polls, five were bred in Maryland,. Two were bred in Pennsylvania, and New Jersey, Virginia, and West Virginia, provided one entrant apiece. Of the group, five are males and five are females. The poll is conducted of media members and others involved in the Thoroughbred industry and restricted to horses that have run in 2019 and were bred in Pennsylvania, Maryland, Virginia, West Virginia, New Jersey, Delaware, and the Carolinas.